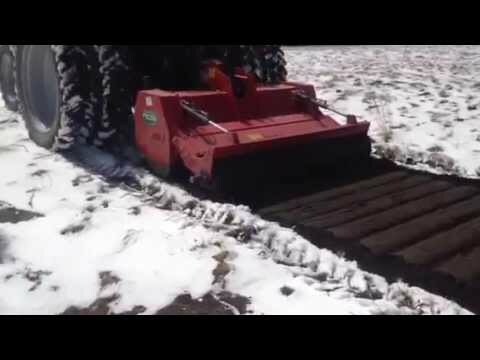 Fecon’s® Soil Hog milling attachments are well suited to milling compacted soil, stumps, and roots, or to blend in stabilizing materials or additives to improve the soil. The Soil Hogs can also be used to fell and incorporate standing trees into the ground if desired. 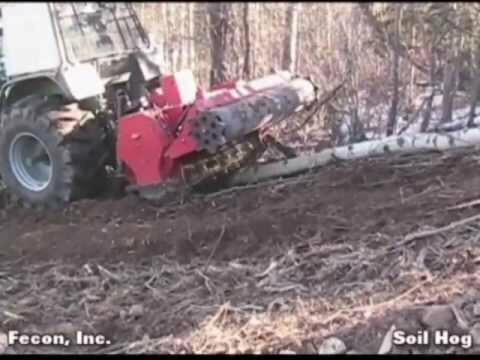 The Soil Hog is ideal for loosening top soil, or milling fields of stumps and roots in order to convert land into tillable acres for alternative crops, preparing for construction or pipelines, and creating ideal planting beds for crops such as blueberries, fruit, nut or Christmas trees, or to incorporate organics back into the soil during rehabilitation of forest land following wildfire. Fecon Milling Attachments achieve ideal results in land preparation for agriculture, forestry, and development. Eliminate multiple steps that are costly and time consuming to provide a finely milled blend of soil, and organics including stumps, roots, and slash. Go a step further by incorporating stabilizing or remediation materials when a homogeneous mix is crucial. Fecon offers multiple models to provide the width, depth and power class to serve many applications on either PTO or Hydraulic carriers. Rotor diameters range from 28”-40” and can be operated at 110 to 440 hp. to mill up to 20” deep. Rotor direction can be configured to the type of carrier and primary direction of operation can be set for desired results leading to faster production and finer material. PTO-powered models include adjustable depth shoes, compacting roller, an overrunning slip clutch, and a synchronized pivoting gear box that allows a broad range of motion to operate smoothly at various depths. Hydraulic models offer a hydraulic trap door to help contain debris, and, like the PTO models, the hydraulic models have adjustable skid shoes and chisel-shaped carbide rotovator tools. Fecon’s rotovator tools are highly effective at processing wood in the soil with abrasion-resistant characteristics and forgiveness to rock. The innovative HDT paddle style rotor utilizes fewer carbide tools compared to most drum-style systems to provide lower hourly operating costs without sacrificing results. The patented rotor system and carbide cutting tools reduce and blend soil, wood and organic material while having durability and wear characteristics necessary for the challenges of sub-soil work. Strong drive lines with reliable belt tensioning systems efficiently deliver power to the rotor while providing long-lasting durability. Durable Rotor Carbide tipped tools, heavy steel plate, AR400 abrasion protection, and an aggressive configuration produce impressive results.